Volunteers make the magic happen at ISTP. With only 21 administrators to run 3 pedagogical programs and 2 campuses, oversee finances, manage security and site, fundraise, operate after-school programming and camps, handle daycare needs, and the day-to-day things that come up, there leaves little time to do the things that make this school special – Arts Night, field trips, Chinese New Year Parade, Taste Day, the numerous in-class activities that expand the education of each child, the list can go on. So how do these things happen? How do we manage to have an 18’ mechanical, fire-breathing dragon in the Chinese New Year Parade? How are we capable of transforming the school into an art gallery and and feeding over 1,000 people for one magical night? How are we able to take our students on amazing overnight trips to Coloma and Point Reyes? Or day trips to museums and theatres? The answer is simple. Volunteers. 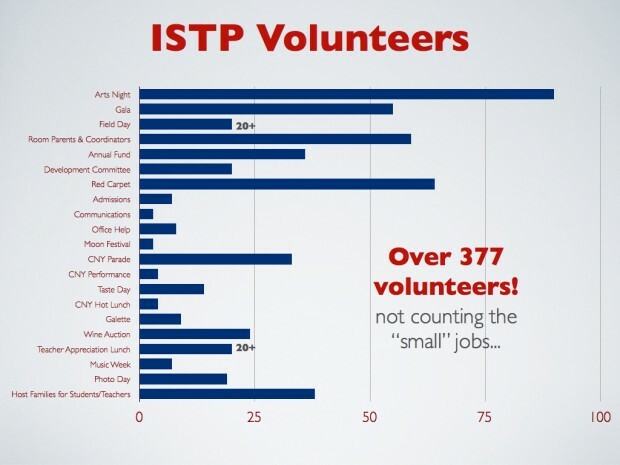 Volunteers make ISTP more than a school. Volunteers make ISTP a community. From putting stamps on envelopes to chairing the Gala, everything volunteers do make so many things possible at ISTP. Every parent who volunteers, whether they work full-time, part-time, or in the home, is giving back to ISTP – even if it means sacrificing a few weekends during the year. And we know you are making sacrifices to make these things possible. There are only so many hours in a day to accomplish all the things we need to do. When you set aside any amount of time to help in the classroom, the library, the Advancement Office, or chair an event – we know you are taking time away from any number of things you need to do. We appreciate your effort beyond words. What's so wonderful about volunteering is that each individual gets to share a special piece of themselves with our community. Each volunteer brings their heart, soul, skills and passion to their task/project, and it translates to achieving something bigger than just "helping out." Not only is it giving from the heart, but it's placing an importance on education. Through the gift of your time and talent, you are saying to your children, "I believe school is important." I can't tell you how many numerous times I've seen or heard students say how much they love seeing their mommy, daddy, grandparent, relative, or caretaker helping with school. It instills a sense of pride and honor in the place where they spend a good portion of their young lives. Trust me, although you may think that the volunteering task you have undertaken is either too big or too menial -- I promise you, it will be remembered by your children or felt by them through the betterment of our school as a whole. 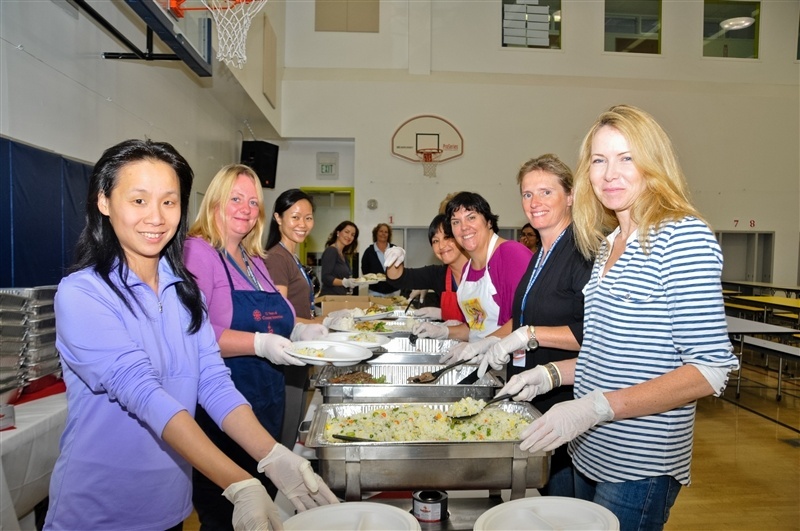 Most importantly, during this special week where we acknowledge and recognize the parent volunteers who have helped make ISTP a better place - we THANK YOU! This community... this wonderful world of international, social, and educational connection that we all share... is only successful with the time, caring, and effort provided by our parent volunteers. We (especially my office!) couldn't do it alone, and I hope that you will be as inspired to join the success and warmth of our community as our students are inspired by your commitment and support of their school. If you're interested in becoming a parent volunteer, please do not hesitate to contact me. I have jobs for all kind of skills and time commitments!